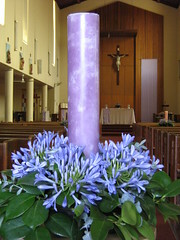 We are now only two weeks away from the Season of Advent. This is the time when we particularly focus on preparing for the celebration of Christ’s coming among us at Christmas, as well as preparing for his promised return at the end of time. I’d like to take a moment now to let you know of two things happening this Advent season. The first is our Friday Evening Prayer in the spirit of Taizé. Many of you may already know of the unique music of the Taizé community that will infuse our evening prayer. Through Fr. Paul’s initiative we celebrated evening prayer this way last Advent, and many came and found it a nourishing spiritual experience. Evening Prayer will be held on Fridays 7, 14 and 21 December, 7:30 – 8:30 p.m. The second applies specifically to our Ministers of the Word. During the Lent and Easter seasons we held a weekly readers’ preparation for those people rostered as readers for the following Sunday’s Masses. Those who came found this a beneficial exercise, and the participation of ministers was evident in excellent proclamation at Mass. Being another important season in our Church calendar, these preparation sessions will occur again for the Advent season on Wednesdays from 7:30 – 8:30 p.m. From next weekend we will publish a reminder in Carmel for those rostered to read the next weekend, and therefore need to join us for the preparation session. Finally, my sincere thanks again to those who gathered and shared their ideas at our parish meeting on Wednesday. It was a very worthwhile gathering. I’ll say more about this next week.